iFixit has published its teardown of the new, fifth-generation iPad mini—the first update to Apple's smaller-sized tablet since 2015. The iFixit team—which sells gear for repairing and servicing gadgets and uses these teardown series to promote said gear—noted that the iPad mini looks on the outside like a smaller version of the new iPad Air. But on the inside, it's an updated iPad mini 4, the team wrote. On opening the tablet up, iFixit discovered a 19.32Wh battery—the same capacity as the previous-generation iPad mini. But there are some notable changes. The front-facing camera module has been updated to a 7-megapixel ƒ/2.2, like the 10.5-inch iPad Pro. That's a marked improvement over the iPad mini 4. There's also Apple's A12 Bionic system-on-a-chip (the same found in the iPhone XS, XS Max, and XR) with 3GB of LPDDR4X DRAM. The updated microphone array has been moved near the selfie cam, and new ambient light sensors support the True Tone feature, which adjusts the white balance of the display based on ambient light conditions for user comfort. 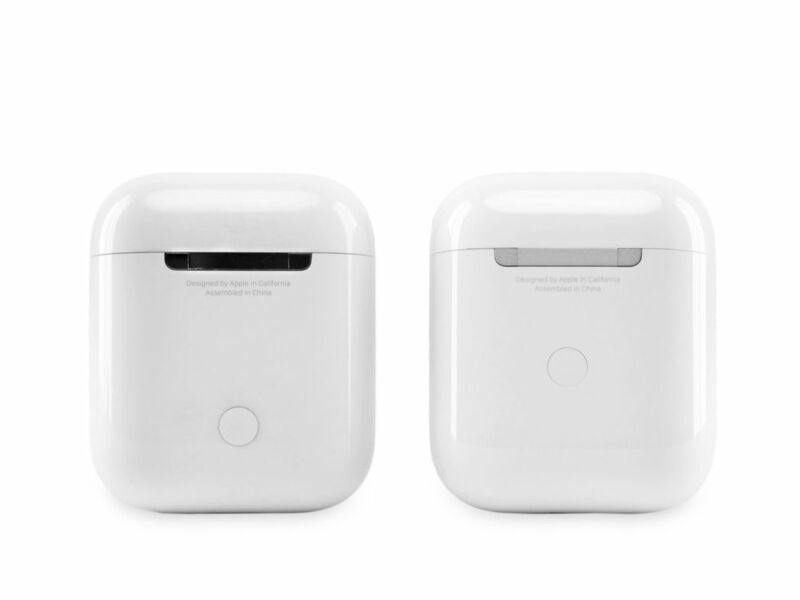 As expected, iFixit tore down Apple's new second-generation AirPods to see what's different about them compared to the previous iteration and just how repairable they are. Let's get the second of those points out of the way right away: they are not serviceable at all. iFixit had to go to almost comical lengths to open the AirPods up, and despite their expertise and tools, the iFixit team was unable to do so without permanently damaging the product. They described the product as "disappointingly disposable," which is to say there is no practical way to service or repair them even at a professional shop. That's disappointing, given that the batteries in the AirPods won't last longer than a few years with heavy use, and they're hard to recycle. Apple does offer to recycle headphones through partners as part of its Apple GiveBack program, but the GiveBack Web portal does not offer a product-specific category for AirPods to consumers like it does with most other Apple products. Consumers may simply select a general "headphones & speakers" category on the site. Following the controlled destruction of the Mac mini and the MacBook Air, iFixit turned its gaze to the new 11-inch iPad Pro. Its teardown reveals lots of adhesive, even more magnets, and only a few surprises inside the newest Apple tablet. Unsurprisingly, the super-narrow bezels make the new iPad Pro harder to get into than the previous models. Awkwardly positioned display ribbons make removing the display more difficult, but underneath it we find the usual suspects: the logic board, speakers, TrueDepth camera array, and batteries, to name a few components. The new iPad Pro should be an entertainment powerhouse thanks to a total of eight speakers, composed of four woofers and four tweeters. Combine those with the Liquid Retina display with a 120Hz refresh rate, and you have a stellar music and video consumption device. However, the speakers proved impossible to remove without destroying a portion of them, thanks to their housings being carved into the aluminum case. Magnets also live under the speakers, and those are just a fraction of the magnets present inside the iPad Pro. On schedule as always, iFixit has documented teardowns of the new Mac mini and MacBook Air and given them each a repairability score. The Mac mini is an improvement over the 2014 model in a few ways. The MacBook Air has some positive points for user serviceability, but it requires a significant teardown to do much. 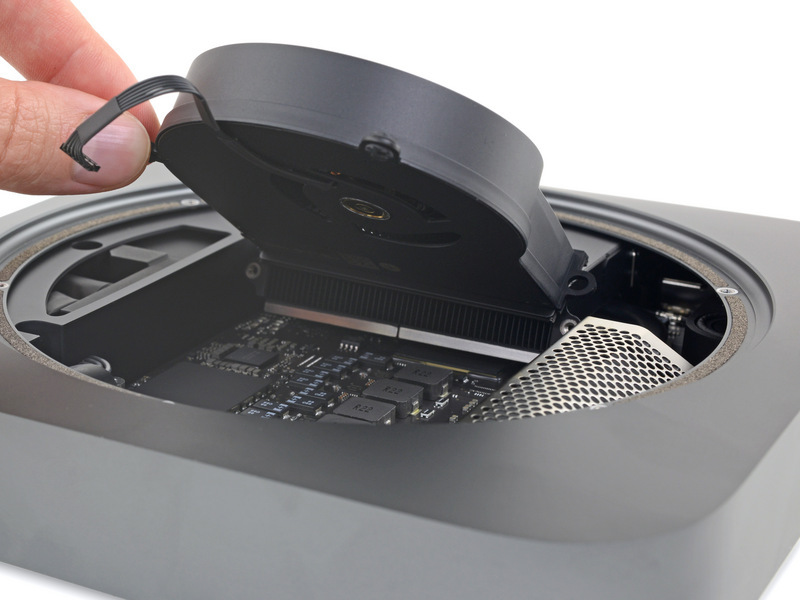 Starting with the Mac mini, iFixit found that after opening the enclosure, you just have to unscrew and remove the fan to get inside. The logic board can be removed without special tools. Unlike the 2014 Mac mini's RAM, the RAM in this model can be replaced. It's covered by a metal cage, but once you unscrew and remove that, it's easy. The power supply can also be removed and replaced, but you'll want to use a tool for it. On the negative side, the CPU cannot be replaced, and damage to any of the ports would require a logic board replacement.